How Many Perfume Bottles Are in Your Collection? I have many, many vintage perfumes in my collection. Although I appreciate beautiful perfume bottles, and would collect them if I could afford to, the extra pennies in my piggy bank go to vintage perfumes in any form I can find them: tiny decants I buy and swap; mini bottles; and occasionally, a regular sized bottle. For those of you who primarily collect perfume bottles, or who are lucky enough to collect both for the bottle and the perfume inside, how many do you have in your collection? What are they? What's your most prized perfume bottle? Inquiring minds want to know! Oh my lord! I'm swooning at all those perfume bottles. The Guelains ... the Lanvins ... ! Thanks so much for the link. I collect only in a modest way, and generally only perfume, not bottles. I've worked in museums for the last 20 year so I know about collections and the collecting mentality, but I don't collect myself. There are things I like to own, but that's not the same as collecting in the true sense of madly desiring the most complete, the most original, the best example of, etc. I do have a little Chanel No 5 collection of which I am proud, and one or two Guerlains that I like. But I use them, I don't glass-case them. My favourite is nothing special - just a Chamade EDP refill bought new which I matched with an empty Samsara gold canister bought on eBay. What I like about vintage perfume (apart from the history angle) is that you can explore interesting and unusual stuff for (mostly) far less cost than modern-day niche perfumes. I'd hate to be captive to the latest Serge Lutens or Amouage. I wonder if anyone collects Kenzo bottles? They seem to be the collectors items of the future. Thanks a lot for the link to my collection ... it' a big privilege to see one part of my collection on your site !!! I hope this brings traffic to your site, Sandrine. You do have a lovely collection! Oh, I didn't know you worked in museums, Anne! There's another Yesterday's Perfume reader in England who is a museum curator, and one (a friend) who works for the New Orleans Museum of Art as the director of education. He took the pictures for NOMA's history of the perfume bottle post I wrote. Also, Kenzo does have great bottles. The one that looks like a leaf on its side looks so much like the Nina Ricci Fille d'Eve bottle that's on YP and Sandrine's site...So lovely. Ah ha! So a pattern is forming involving museum workers and vintage perfume lovers! Cool. I like VP because it offers a way of engaging with the past in a completely different way from my day to day job, which is all objects, text and images. So you can see why I love your blog so much. Maybe the Robert Piguet fragrances would have the same effect as Miss Dior? Not sure, I've never smelled them and you'd have to smell them in vintage, I think. many thanks and yes it brings traffic to my site I hope people enjoy !!! I've never really counted so I'm not sure of the exact number. I think knowing might shock my brain. I have them scattered in 3 rooms. The living room has an antique curio cabinet for the ones I'm really proud of ( I like just sitting on the floor looking at them), the spare room stores the minis and various essential oils, and the bedroom houses the ones I wear the most and aren't necessarily vintage. I have a few empty ones but for the most part I don't buy them unless they still have at least some of their contents. I'm a user and not just a looker. Probably the one that looks the prettiest in the cabinet is the HUGE Flora Danica cologne bottle I "scored" at an Antique Store for $25. It has to hold somewhere between 6-8 ounces and the cologne still smells beautiful. As most all of you know it's tilted so you can see the flowers painted on the other side. I'm not at all surprised about the connection between museum work and perfume collecting. I think all of us who collect vintage perfume, clothes or whatever have a deep connection to the past. I have a feeling all of us "vintage lovers" would be the first ones in line to hop on a time machine. I mean, which one of us wouldn't want to go back in time, walk up to the counter & smell the original Coty Chypre? Ooh, I'm embarrassed to say how many perfumes I have! I think it's closing in on 200 but that includes decants. I'm not a "collector" but I do feel that to speak with any authority about modern perfumes, one has to know and wear the classics, and so any collecting I do goes in that direction. 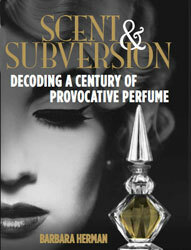 So I have aquired Joy, Shalimar, Bal a Versailles, My Sin and others like that in perfume. Also some Coty Chypre (in EDT). Some others like that, usually bought on fleabay, A fellow blogger was kind enough to send me a decant of vintage Tabac Blond, which is wonderful. And so on. Lately, though, I've been looking for discontinued fragrances, because the formulas tend to be the originals and because, well, they're discontinued. The Piguet fragrances are something else, Anne. You do indeed have to try them in their vintage form! Some of my favorite vintages are vintage Piguet dames — bitter green leather/tobacco Bandit; boozy lush Baghari; heady, indolic floral Fracas; and the mysteriously docile and short-lived Futur. (Im sure Im missing something.) Engagement in the past, yes; but a contact sport engagement.